© Andrew Harnik/Sipa USA/TNS Senate Majority Leader Mitch McConnell (R-Ky.) speaks at the U.S. Capitol in Washington, D.C., on August 31, 2018. Mitch McConnell didn't break his trademark stoic expression Saturday afternoon as his colleagues methodically voted, one by one, on whether to place Brett Kavanaugh on the U.S. Supreme Court. It cemented his status as a virtual icon among Republicans and a convenient villain among Democrats. To Republicans, McConnell is now a 21st century political hero, a leader who refused to surrender to political correctness or to the loud, angry, persistent voices of the left. He is someone who stood up for "due process" and the standard of a "presumption of innocence," even if that carried a great risk of appearing to look unsympathetic to, or incredulous toward, Kavanaugh's accusers. Party loyalists are enthusiastic about McConnell's ability to harness collective rage over what they saw as Democratic gamesmanship, and praise his strategy of directing that disgust towards a cherished outcome: giving a conservative judge a lifetime appointment on the most powerful court in the land and the power to shape the judiciary for a generation. Back home, he has all but assured himself an easy victory in his 2020 Republican primary election. "I'm anxious to see him give that first speech to a Republican gathering back in Kentucky, where he talks about how he and Donald Trump fought the liberal mob and won for Brett Kavanaugh," said Scott Jennings, a longtime McConnell consultant. Democrats, on the other hand, have never been more energized to take McConnell down, from inside the state and beyond. "There's a national interest (in defeating McConnell) in a way I don't think we've seen before," said Kentucky Democratic Party Chairman Ben Self. Apart from Senate Judiciary Committee Chairman Charles E. Grassley of Iowa and Sen. Lindsey Graham of South Carolina, few Republicans did as much to make themselves the public face and voice of the "Confirm Kavanaugh" movement as McConnell. For the past several weeks, whenever the Senate was in session, McConnell came to the chamber floor to deliver opening remarks for the day. His speeches always aggressively focused on Kavanaugh. 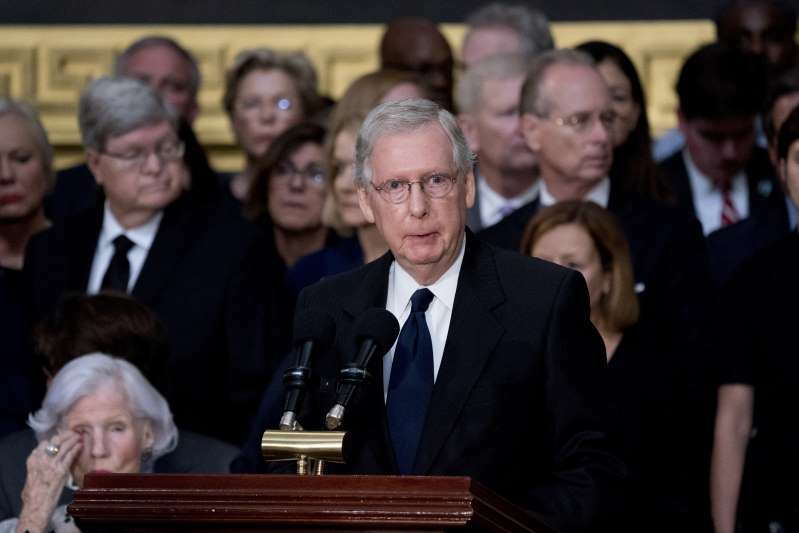 "(McConnell) set the tone every single day for what the message of the day was gonna be, and the (Republican Senate) conference has largely followed his direction on that," Jennings said. Never for a moment did McConnell waver in his support for the federal judge once allegations surfaced. Even before Ford testified before the Judiciary Committee Sept. 27, McConnell was telling Republicans that the Senate would ultimately confirm Kavanaugh. A delayed vote, he said, was simply a bump in the road. But as he worked diligently to assure his base he wasn't abandoning Trump's nominee, he also worked to assuage concerns among undecided Republicans by demonstrating that the Senate would pursue a process that treated Ford fairly. "Just to agree to Dr. Ford's request for a hearing" was an important moment in McConnell's plan for Kavanaugh's confirmation, said Graham. "He could have played hardball with that with Chuck (Schumer, the Senate minority leader), and he didn't." Kavanaugh had already had a confirmation hearing that began Sept. 4, a hearing that was contentious but calm. Then came the public disclosure of Ford's accusations, and Kavanaugh had to come back three weeks later and appear before the committee again - this time after Ford herself. Fine, McConnell said. On Sept. 28, the day after the Kavanaugh-Ford hearing, Senate Judiciary Committee Republicans got a surprise when Sen. Jeff Flake, R-Ariz., said the only way he'd vote to advance Kavanaugh's nomination to the Senate floor was if the FBI was permitted to conduct a supplemental investigation. McConnell gathered committee members in his Capitol office to discuss what the parameters of the investigation should be, winning goodwill by leading the group through various options to ensure that everyone felt comfortable with the arrangement - from those on the fence such as Flake to those who had already made up their minds. "He did a good job of providing the sort of a focus that got us to the point where we could move forward," said Sen. Thom Tillis, R-N.C., who attended the meeting. On Friday, the day before the final confirmation vote, McConnell had lunch with Sen. Susan Collins, R-Maine, a few hours before she delivered her lengthy floor speech announcing her decision to support Kavanaugh. When it was time for her to give that speech, McConnell came to the floor and sat in his usual front-row chair, which he turned towards her so he could watch, with rapt attention, as she chided Democrats for political games and contributed to a "dysfunctional circus" of a confirmation process. McConnell might have played the long game well for Republicans, but Senate Democrats might have soured on the GOP leader permanently. "I've never been through few things more humiliating than sitting in that SCIF being told I had 60 minutes to read an FBI investigation that, frankly, should have normally taken hours or days to process," said Sen. Chris Murphy, D-Conn.
Murphy was referring to the circumstances under which senators were permitted to read the FBI report - in a "Sensitive Compartmented Information Facility" in a basement room on Capitol Hill, where senators had to share one copy of a single document, over the course of just one day. They alternated by party, meaning Democrats and Republicans could not be in the room at the same time. McConnell doesn't seem concerned about Democrats. At a news conference immediately after the confirmation vote, McConnell was unapologetic about how he engineered a confirmation vote of 50-48, the slimmest margin by which a Supreme Court justice has been confirmed in 137 years. He had just gotten off the phone, he said, with Kavanaugh and President Donald Trump. "We stood up for the presumption of innocence," he said. "We refused to be intimidated.